According to the release notes, Mountain Goat hasn't held back on the hops with its latest Rare Breed: the brewery's IPA variant 4,279 by our count. Not only have they added a new variety they've not played with before (Calypso), but they've added them in such volume that they're claiming a round 100 IBU [International Bitterness Units], which is supposedly around the limit of most human's ability to detect bitterness. 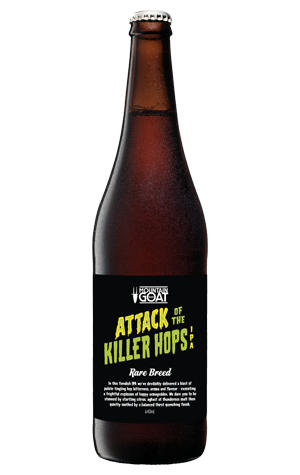 What's more, the name – Attack of the Killer Hops – suggests it's going to be a beastly affair. Yet, the beer, which opts for B Movie stylings on the label in the wake of Pulped Fiction's Tarantino-inspired look, is a rather more delicate affair. The hops give it lifted tropical, citrus and piney aromas and flavours alongside some light, sweet malts. And the beer is surprisingly gentle on the palate too considering its booze content and heavy hopping; the latter must have been added late enough to ensure this is no palate wrecker, more an attack in which the aim is to kill with kindness.